The holiday season is all rush, rush, rush, and then full stop. The gifts have all been unwrapped, the dinner has been eaten, friends and relatives are all relaxing and possibly preparing to head home. It can all be a bit underwhelming. The perfect solution is a special “after the Christmas rush” teatime. It will smooth out those last remnants of jangled nerves and yet give you a nice uplift. That’s the wonder of tea. Your best option is a gongfu style teatime with a gentle oolong. The very nature of gongfu is one of discipline and order. After the utter chaos your life has undergone for the past month, going through the various steps of a gongfu tea preparation [http://www.jas-etea.com/gongfu-tea-preparation/] is a great change. You select your tea with care, set up the tea implements, and prepare the infusions — each one short and different in flavor, aroma, and even mouth feel from its predecessor. Don’t forget to set the scene. While Christmas is all about reds, greens, and golds, with lots of sparkle and shine, and the warm glow of lights and candle flames. This doesn’t always seem quite in line with the simple beauty of a gongfu teatime. But it is — in fact, all those colors and sparkle and shine can make the teatime even better. The tea will sparkle in the teapot and in the cup. You can go with a more Western style teatime, though, and still have that soothing yet uplifting experience. 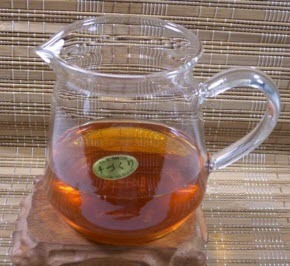 I would recommend steeping about two cups (16 ounces) of a nice black or green tea. They are uncomplicated and basic. Steep them up a bit lighter than you usually would. That assures no bitterness and therefore no need to add any kind of sweetener. Just pour the tea into delicate cups, if you have them, and sip gently at regular intervals. Each sip will return to you a portion of peace and sanity. As a third option, get out that glass teapot or gaiwan and select a nice pu-erh (a raw one would probably be just the thing here) and watch the leaves dance in the hot water as they steep. Since you can usually get several steeps out of those same leaves, your teatime can go on until those relatives are packed and bidding everyone goodbye. This entry was posted in Holidays and tagged Christmas, holiday, JAS-eTea, tea. Bookmark the permalink.